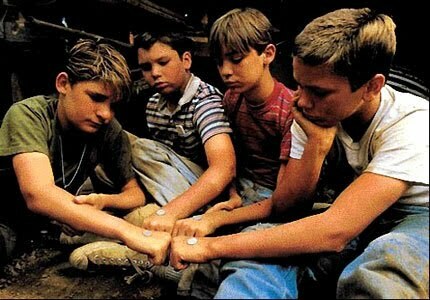 Gen Xtinct: "Stand by Me"
It's been 25 years since Gordie, Teddy, Chris and Vern set out on the adventure of their young lives, sparked by one of the most jarring lines a kid's ever uttered in the movies: "You guys wanna go see a dead body?" Yep, "Stand by Me" is a quarter-century old -- and most of the cast and director Rob Reiner reunited last week to celebrate, and promote the new DVD/Blu-Ray release of this classic coming-of-age flick. I appreciate just about everything about the movie, from the harrowing train-trestle run to "Chopper, sic balls," to the part where the other kids tease Vern by launching into "I ran all the waaay hooooome" every time he tried to talk. The writing was phenomenal, and the child actors -- Jerry O'Connell, Wil Wheaton, Corey Feldman and the late River Phoenix -- absolutely nailed it. And I really, really love that the movie, based on a novella by Stephen King, finally showed the world that the the author was about a lot more than just telekinetic teens and posessed cars. King drove that point again in a big way eight years later, with another flick about enduring friendship, The Shawshank Redemption. Here's a look at the movie's trailer. How about you -- does "Stand By Me" still stick with you, too? Wil Wheaton wrote a nice post on his blog yesterday about shooting a Stand By Me reunion with Jerry O'Connell, Corey Feldman, Rob Reiner, and Richard Dreyfuss.